Martin Weiss: When Will the Next Crypto Bull Market Begin? Home » Investor News » Martin Weiss: When Will the Next Crypto Bull Market Begin? Let me take you on a quick trip to the recent past. The time is mid-August, 2015. Bitcoin investors are tired and disgusted. Their beloved cryptocurrency has crashed and then gone nowhere for eight months. Wall Street “experts” say Bitcoin is “dead.” But they’re all in for One of the greatest surprises of investment history. It climbs back above the red line in the chart below. 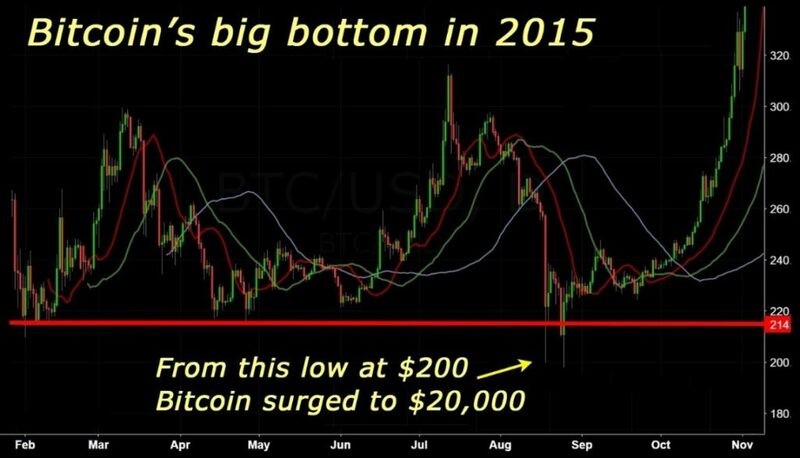 And it keeps going, going, going … until, just over two years later, it surges from $200 to $20,000. Now, fast forward back to the present. As in 2015, Bitcoin crashed and then went nowhere for eight months. As in 2015, this week, it started to fall again, plunging below critical support (at the $5,800 level). Will the second half of the story – a massive new crypto bull market – also repeat itself? If so, which cryptocurrencies will lead the way? When is the surge likely to begin? In our upcoming Urgent Cryptocurrency Briefing, Tuesday, Nov. 27, we will provide the answers. Explain why now is NOT quite yet the time to buy. Name three red hot cryptocurrencies and show you how they could rise several times more than Bitcoin. One is about to transform the entire financial industry. The second is 1,000 times faster than Ethereum and already being used 10 times more. And the third could virtually replace the entire internet. Map out the likely timing of the next major up cycle to new all-time highs. Show you how our Weiss Cryptocurrency Ratings could have helped you avoid devastating losses this year. Send you our list of 20 popular cryptocurrencies we wouldn’t touch with a ten-foot pole. Do not miss this urgent briefing: Click this link to reserve your place now. It’s free. And it will only take you a few seconds. * On November 27, when you attend our video session online or you get the transcript, please be sure to read about the investment risks and how we calculate these numbers. Keep scrolling down to read more investment advice from Martin Weiss on Money & Markets.